July 1916 had been a dreadfully hot time for thousands of New Englanders. Combine this with the new craze for swimming and you have busy beaches. In an effort to escape the heat New Englanders took to the sea, swarming the beaches. There was little to no fear of sharks since time and time again it had been “proven” that sharks were not man eaters. On 1 July 1916 Charles Vansant went out for a swim in the mostly deserted waters near Engleside Hotel. He swam out a good distance with a dog frolicking in the water nearby. On the shore a small group of people was forming to watch Vansant’s swim. In more recent times long distance swimming had become popular. At a certain distance the dog turned back for shore and Vansant turned to follow. As he swam someone on shore noticed the emergence of a dorsal fin closing in on the man. Shouts of “Watch out!” poured out from the shore. Before anything could be done the great white shark chomped down on Vansant’s leg. Vansant gave an agonized scream. On shore his father, mother and sisters looked on in horror as the water turned red with blood. Men poured into the water to save Vansant who could not get free of the shark’s vise-like grip. Rescuer and shark fought over Vansant, each unwilling to give the man up. Vansant was dragged to shore with the shark following close behind. It was nearly to the beach when it turned tail and fled. Vansant had suffered catastrophic injuries and later bled to death in the hotel. In the aftermath the public found it quite difficult to believe what had happened was the work of a shark. This encounter alone would do little to deter many other swimmers from entering the Atlantic. Five days after Vansant’s death Charles Bruder took a break from his duties at the Essex and Sussex Hotel to go for a swim. This evening he would be trying for a long-distance swim. Once out in the Atlantic the lone figure drew the attention of the lurking shark. Bruder was ferociously attacked. A sudden spray of water caused by the shark’s attack drew the attention of people on shore. One woman mistook the bloody water for a red canoe. Two surf men immediately made for Bruder in a rowboat. Bruder was attacked again and again before the rescuers arrived and pulled him to saftey. The two men worked to stop the bleeding from what was left of Bruder’s two legs. Sadly Bruder lost consciousness and died. His wounds were so ghastly that those on the shore who witnessed his body being dragged ashore were visibly overcome at the sight. With Bruder’s death plans were put into motion to capture the shark or whatever it was (scientists would continue to disagree that it was a shark. An orca maybe, but not a shark. Knowledge then was rather limited in regards to the creatures). By July 7 the hunt was on. Beaches were either closed down or enclosed with steel nets and patrols set up. The boats that went out to find the shark had no luck in baiting it. The next stop on the shark’s list was the small town of Matawan. On July 11, three boys went for a swim in Matawan Creek. One of them was bumped by the shark and received some painful scratches. Screaming, he fled the water telling his comrades to get out of the creek. They did not heed his advice. The next day Thomas Cottrell, a former sea captain, went to investigate the wild stories that had made the boy a laughingstock. As he was crossing a bridge the shark swam under it and headed for Matawan. Quickly Cottrell raced to the town to inform the town constable but only to prove himself a laughingstock, as well. Although no one would take him serious Cottrell was not about to give up. He took to his motorboat and yelled warnings to swimmers in the water making his way down the creek. That same day 11-year-old Lester Stillwell along with some other boys headed for the creek. Cottrell was gone and the boys had not heard his warnings. So unaware of any danger they entered the water. Stillwell was playing in the creek when a friend saw the shark bearing down on the boy. The shark grabbed the epileptic boy and dragged him under. The shocked boys ran into town exclaiming the horrible news. Again it was thought not to be a shark, but that Stillwell had had a fit and merely drowned. Nevertheless a search was carried out. Stanley Fisher, a local tailor as well as a good swimmer, arrived to lend a hand. With a friend they strung a steel net across the creek before they dived in to locate Stillwell’s body. They had been searching long and hard and were headed back to shore when Fisher dived one last time. When he surfaced he yelled to the townspeople on the shore he had Stillwell’s body. He had taken Stillwell’s body away from the shark and was trying to get to shore while fending off the shark. In the fight Fisher lost Stillwell’s body but managed to make it to shore. His injuries like the victims before him would prove grievous. Fisher died at Monmouth Memorial Hospital. Very shortly after the attack on Stillwell and Fisher, the great white attacked 14-year-old Joseph Dunn. Fortunately he was rescued but not before the shark had injured his leg. He would be the only victim to survive the shark’s attacks. On July 14 Michael Schleisser and John Murphy were out trawling in Raritan Bay in an 8-foot motorboat when they accidentally snagged the catch of a lifetime. A 7.5 foot great white shark. The shark put up a fight, nearly sinking the boat as it worked to get to Schleisser and Murphy. After beating the shark in the head numerous times Schleisser managed to kill the “man-eater”. Bones found in its stomach would later be identified as human. The great white was confirmed to be the shark that had wreaked havoc along the Jersey shore. Yet even today controversy exists about the matter. Riveting account. Always interesting posts. That’s good to hear, Pierre! You do realise that you have done nothing to help me overcome my selachophobia! I wonder how they ‘proved’ that sharks were not man eaters prior to these attacks? I doubt they dangled a squirming victim over the side of a boat…. Crumbs. And this post is dedicated to you. 😉 So good of you to psyche yourself out and read it though. It’s a start to overcoming your phobia. Regarding the proof, it was worse than that. He went swimming with sharks! 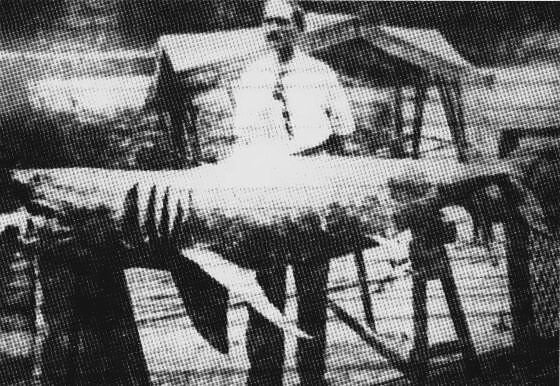 In the 1890s millionaire Hermann Oelrichs, as proof of sharks on the East Coast(?) being relatively harmless, jumped into the ocean to go swimming with the beasts. He came out alive and unharmed. He later put an advertisement in a newspaper offering $500 anyone with proof of a shark attack. No one stepped forward to claim that reward. Scientists also tended to agree with Oelrichs assessments. Apparently people didn’t put much stock in the sea stories told mostly by sailors. If there wasn’t any proof they didn’t believe it. Much of the East Coast was considered pretty safe without much threat from the sharks that roamed the waters. I can imagine not putting much stock in sailors tales, after all, how many times did they tell the giant sea monster story once they had a few drinks under their belt? Haha! Yeah, right? I don’t know what type they were, but they were “big”. But then so was Oelrichs. Possibly they didn’t want to take on someone like Oelrichs not knowing whether they stood a chance of taking him down or not. Chapuzzo wrote that whether they were a harmless species or not, is unknown. Now that you mention it, I never thought of anyone as having seriously considered taking Oelrichs up on the bet. Oelrich after all was something of a daredevil. I dunno. It would have been a little difficult unless someone had quite a few credible witnesses like Oelrich had. Maybe someone would throw his buddy in the water, wait for him to get attacked, reel him back in and others would harpoon the creature. And then it could be presented to Oelrich. Wow, awesome story. You had me on the edge of my seat for this one! Happy to hear you found it interesting, Cindy! Like Metan up there I have a slight case of selachophobia. Hey thanks, you just taught me a new word :). The hair on the back of my neck is on end. It’s a gruesome story, isn’t it? If I told you how many times my boys have watched Jaws!!!!! Great post! I am amazed at how ignorant they were back then about the very real danger of shark attacks. I live very near Fish Hoek beach in Cape Town (google it) and know only too well of the dangers – we’ve had one fatal attack and another British man lost his leg. There’ve also been lots of fatal attacks along our South African coasts. One thing is for certain, love the or dear them, you have to have the greatest respect for sharks!!! It is mind-boggling, isn’t it? I guess they valued the opinions of professionals over sea yarns. Shame. Yikes! Remind me to steer clear of those waters! That’s awful. 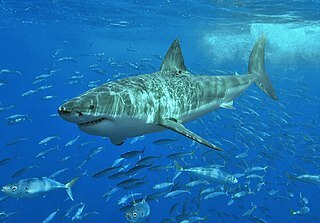 In Chapuzzo’s book he mentioned that the likelhihood of great whites attacking was greater during high tide (a study carried out in South Africa). You’re welcome and stay safe! Shhhh…. I am so glad the we live an hour from the beach! We do have a lot of reported shark attacks, just recently some guy was out surfing when he was attacked twice by a shark. He was friends with the lifesavers on the beach so some of them went out to save him (amazing bravery!) and the police must have been nearby because they went out in a boat to try to help too, shooting at the shark. No, the surfer didn’t survive. The original report in your post says Vansant was swimming near a dog when he was attacked, one thing that is advised here is not to swim with dogs as they attract sharks, and to stay out of disturbed water, like a river mouth, as some sharks like hunting in the murky water. That’s awful. 😦 I take it to the lifesaver got out all right? Apparently in Catherine Crout-Habel’s necks of the woods sharks carry lasers. 😉 I like the “man-eating koalas” part. Drop bears? 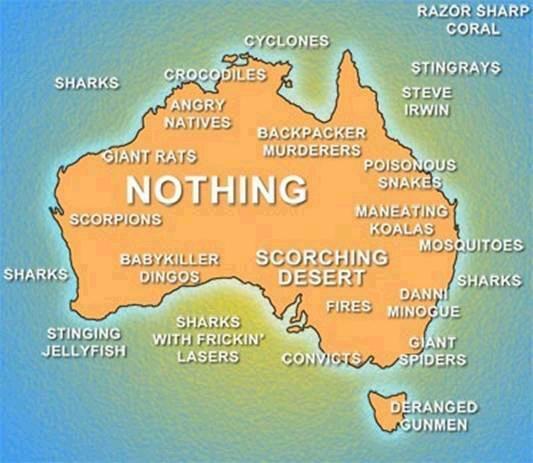 Is/Was Steve Irwin considered some sort of affliction/danger because his name is up on the north eastern coast. Yep. I read that too. Swimming with a dog increases one’s chances of being attacked by a shark. But I, um, forgot why. I think it is the movements of the dog that attracts the sharks, their paddling is like an injured fish. Great post. I was really able to sink my teeth into this one. I also was on the edge of my seat reading this. When Thomas Cottrell gave warning I would have listened. I guess it was kind of strange to the townspeople that a shark would have come that far inland. Although one has to wonder how many lives Cottrell did save by warning swimmers out of the creek. Three cheers for Cottrell! I bet it was strange to them that it would come in close. Glad that Cottrell did warn them and agree that it might have saved some. I once read that part of the shark’s problem was that it was being slowly poisoned, or whatever the term would be, from fresh water. Basically, the farther inland via the river it went, the more disoriented it became. I don’t know how accurate that hypothesis is, but the idea of a crazed shark wandering the creek waters seems even more terrifying! Yes, that was also mentioned in “Close to Shore”. I agree. Don’t know what could be worse; a shark in full possession of its senses or one going mad! I have to say that, while I am an animal lover, sharks tend to give me the creeps. One last point regarding your interesting post is that it proves how much damage prejudice and preconception (“sharks cannot be maneaters”) can do and how hard to overcome they generally are. A few years ago there was a show on Discovery about these events. Have you seen it? I haven’t seen it. Do you recall the title? I wish I did. I’ll do some searching. Alrighty. If you find it I’d be interested to hear what it is. Yes, hard to overcome is right. Even when the shark had been caught (before and after the bones in its stomach were verified as human) some of the leading scientists couldn’t believe sharks would attack or eat humans. They even came up with a theory of how those bones could have ended up in its stomach. Thank you also for sharing the article. Great whites scare the living you know what out of me! For instance, I will never understand why certain of my scuba diver friends are excited at paying a small fortune to dive inside a cage just to see Great Whites trying to have a snack… It beats me. That gives me goosebumps just thinking about it. I will try to be semi-neutral and say it takes guts to do something like that but $650 could be put towards something that still deals with the ocean, like a cruise ticket. But then that might not be such a good idea either as Carnival recently “lost” two of their passengers. Knowing how the scientists were then and that really believed most sharks were perfectly harmless they probably would have taken you up on that. I never realized how small, relatively speaking, the shark believed responsible for the 1916 attacks was. Seven and a half feet is nothing to sneeze at, but one always pictures man-eating sharks as much larger. Of course, when something has all those teeth, it doesn’t have to be 18 feet long to be a menace. Yes, I was expecting a monster-sized creature at the end of the book. You probably already know this but sharks loose their teeth over and over again only to grown them back. That in itself is a scary thought to this poltroon. No chance of a shark going toothless. I’d not heard the theory about the shark in question possibly being affected by fresh water, which may have prompted his actions. As someone who likes to swim in any body of water he can find, it would be reassuring to think that this sort of activity was the result of irrational behavior, rather than a shark who decided arbitrarily to start feasting on people. Yes, it would. But then there is the bull shark which can survive/function in freshwater as well as saltwater. There were speculations that perhaps the “great white” that was responsible for these attacks was really a bull. Two years ago a bull shark (albeit a dead one) was found in the Ohio River. I think this is more common in the Mississippi River, however. I’m never going swimming in open water again. That shark may have been “small” but it was determined. I would probably sail, but swim I will not. There was talk of it being possibly more than one shark but given that the attacks stopped after the great white was killed I would think it was just the one. If you have ever been to a beach, you might have noticed a plane or copter flying along the coast often. These are not people just enjoying the beach/water. They are spotter planes. They check for sharks (and other things). If pods of sharks or lone large sharks are spotted, proper agencys are notified and warnings are sent out. We live with this here in Florida all the time. If you are intending on going to the beach, get informed in what the flags mean at lifeguard stations and or police stations near the beach. It could save a life. Actually, now that I think about it, I have been to the beach in Pensacola but that was ages ago and I don’t even have any memories of it. I wasn’t aware of the spotter planes. Fascinating information, thanks for sharing it! You are a great storyteller. I was gripping the side of my chair as I read. I was thinking of heading to the beach this weekend. Hmmm… maybe I’ll stay home and garden. I enjoy reading your posts.